My First Sheet Mask Experience: The Face Shop – amandarobots. Sheet masks are a creepy-looking skincare craze. It’s predominantly popular in Asia, where a lot of really cool and innovative beauty products come from (like BB cream, fibre mascara, and double cleansing). As it turns out, The Face Shop is a South Korean brand that tries to bring natural ingredients into their products. I took a look at a lot of their offerings, but by far the most interesting display – in my opinion – was the massive wall of sheet masks. For those of you who aren’t sure what they are, a sheet mask is a single-use face mask. It consists of a disposable cotton sheet pre-soaked in a liquid. To apply it, you lay the sheet on your face and let it sit there for a bit. 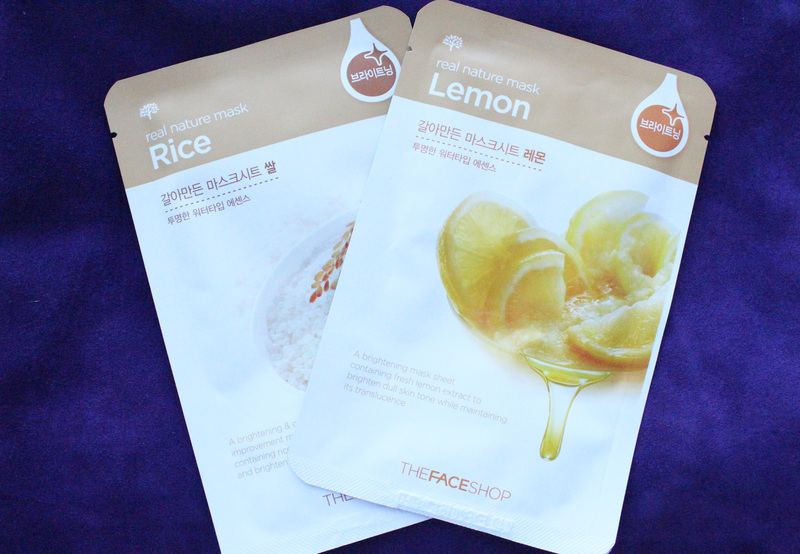 I picked up two masks that claim to boost skin’s radiance: Rice and Lemon. Each one cost $2. From my time at Origins, I know that both of these ingredients are great for getting your glow on (which is a thing I seem to be obsessed with, huh?). …but I made do by editing a paper and keeping my mind off how weird I looked (after snapping the photo, of course). I can’t say I saw dramatic instant results, but my skin does look healthier and glowier as of late, but it could be because I’ve changed some elements of my skincare routine. In any case, I liked the experience and, at $2 a pop, it’s a fun little treat. I just stumbled across your blog and now I’m going to subscribe to your youtube! I am becoming a big fan! Haha, any whos. The Face Shop is one of my favorites Korean brands, super great skincare all around. I definitely recommend giving some of their other products a try. That’s great – thank you so much for stopping by! Do you recommend any particular products? Their black sugar scrub is pretty bomb! I have a hard time with getting little black heads on my nose and in the larger pores on my cheeks so this scrub helped without drying my skin out…and it didn’t feel like I was scrubbing my skin off with sandpaper. I definitely recommend.